I’ve been recording the wild plants that I find in my three-quarter acre Scottish hill garden and I’ve now decided to include non-wild (cultivated or ‘garden’ plants) and non-native plants (naturalised ones that we like and ones we’d really rather be rid of) as well. 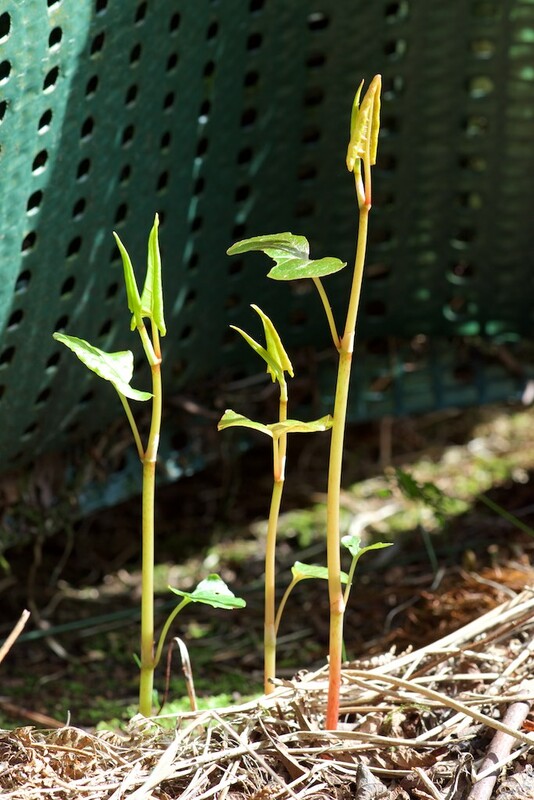 So here goes: I’m going to start with the well known and well hated invasive ‘weed’, Japanese Knotweed. In 2006, when we moved here, this is what it looked like in the back garden. 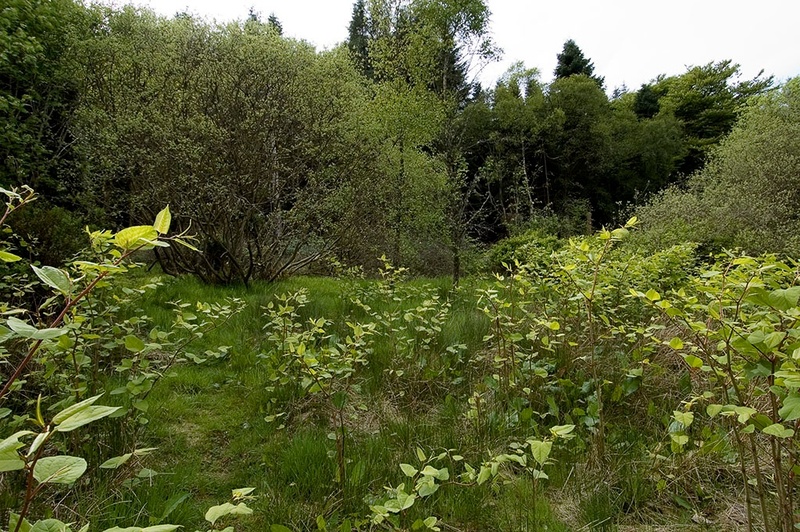 Japanese Knotweed at the Boggy Brae in May 2006. By August, when we actually moved in, it was taller and ‘fatter’ and flowering. Nowadays, most shoots are small when I find them and pull them out. The idea I’m working on is that the rhizomes will have to use themselves up growing new shoots and the more I pull out the less plant food is left in the rhizome. The alternative is to spray with leaves with glyphosate. We have done that too and probably will again. 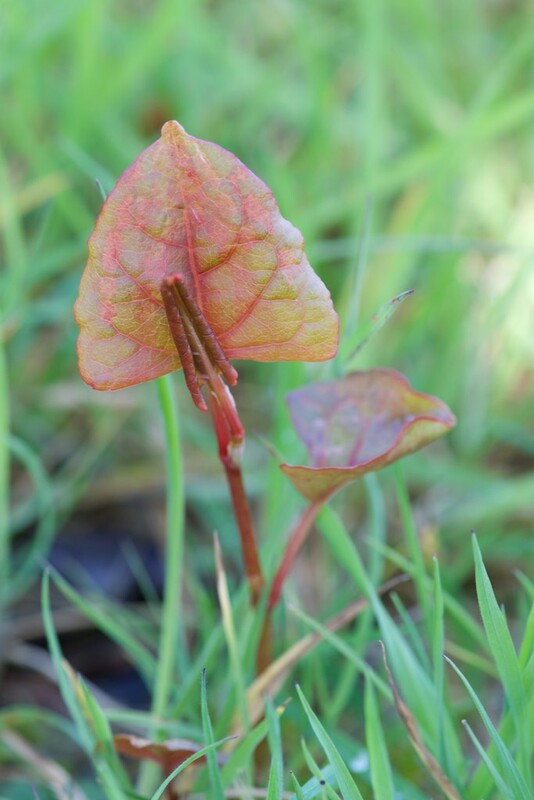 Small shoot of Japanese Knotweed, easy to find because the red shows up against the green grass. Slender shoots of Japanese Knotweed between the old goose house and a board that was leaning up against it. I’ll have to keep an eye on that spot. The plant list includes ferns and bryophytes as well as flowering plants. I’ve moved the fungi to a separate list. That currently stands at 41.